NEOFLEX is a subscription based video content management system. 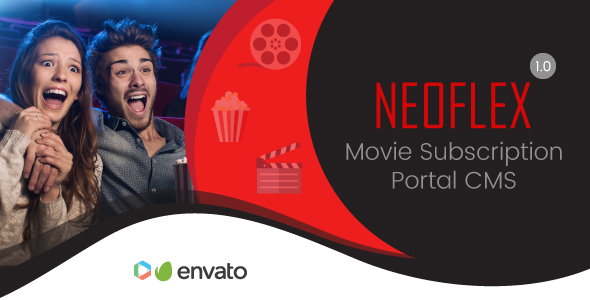 Create your own movie and tv series website using NEOFLEX. Sale them to your customers in a monthly subscription model and build up your video content business. It is a NETFLIX clone! One purchase code is valid for one domain. Read all the manual and documentation carefully before using the script. Install the script in your server following our provided instruction. Login as site administrator to organize your system. At first create few genres and actors. Genre is must to show movies/tv series under them. Create movies from ‘Movies’ page by navigating menu. You can use any youtube video url or hosted video file url as movie source. Genre is required to show movies to your customers. Actors can be multi value selected. Thumb image & Poster image is needed for movie icon and banner display. You can also create tv series in same way. For organizing a tv series, you need to create a season first and then create episodes under a season. There are 3 packages by default. Basic, Standard, Premium. Customers need to purchase any package before watching any video or tv series. Each package remains valid for 30 days. Basic has 1, Standard has 2 and Premium has 4 user access. After logging in a subscribed customer, he needs to select a user from list according to his purchased package. Accessing same user from multiple devices simultaneously will logout the earlier user. We have implemented the necessary strong security to maintain user access limitation. You can rename those packages, change the price of the packages, deactivate/activate packages. Deactivated packages won’t be shown in the home page and during customer’s package purchase. Packages can’t be deleted or created. If you have plan for more packages, please contact support for customization work. Customers will purchase your packages via paypal. You need to set your paypal business/merchant email from settings page. For your local payment gateway setup, please contact support for customization work. You can watch the sales report from report page. Monthly package purchase report is shown with total earned revenue. Your website settings can be edited from settings menu. Website name, logo, email, invoice address can be edited. You can publish frequently asked questions for your customers publicly by creating them in ‘Customers faq’ page. This entry was posted in php-scripts, project-management-tools and tagged episode, movie cms, movie streaming, Netflix, php video script, plyr.io, tv series, video cms, video membership, video portal, video script, video subscription platform, video website by dadmin. Bookmark the permalink.